Sunday night I had that achy, yet satisfied, bone-tired feeling that comes from having done a good couple of days’ work. Having been away for two weeks at the end of the summer, I was afraid it might be getting too late to get a good supply of tomatoes and peppers to put up for the winter. So, the Culinary Enthusiast and I went to London’s Covent Garden Market Saturday morning, where I may possibly have gotten carried away — just a little. I found what I was looking for at the Empire Valley Farms booth, and we staggered home with a half bushel each of red shephard peppers and Roma tomatoes, plus 8 quarts of beefsteak tomatoes, a pint of cherry bomb peppers and a supply of Ontario garlic. With the exception of the garlic, all were grown at Empire Valley Farms in Wallacetown, southwest of London. It’s so nice to be able to talk to the people who grew the food you’re buying. They even gave me a recipe for roasted red pepper soup, which sounds very good as a richer alternative to the version that I’ve developed. The first order of business was roasting the peppers. I’d never used Red Shepherds before, but the woman at the farm stand recommended them to me. And I figured that since they’re about twice the size of the average bell pepper, this would make for more efficient processing. The Culinary Enthusiast fired up the barbecue and charred all the peppers in two batches. It’s good to have help! We put the roasted peppers into large bowls and covered them with plastic wrap to let the skins loosen. Now, I don’t know what I was thinking, but peeling, deseeding and chopping 30 peppers is a big task. Big! I easily spent 2 hours at it, and by the end my hands were orange and my fingertips felt burnt. The whole counter and two chopping boards were sticky with pepper juices and speckled with bits of char and errant seeds. But, oh, it was worth it. I have about 12 cups of rich tasting sliced roasted red peppers portioned out in bags and chilling out in the freezer, just waiting to be called to action in a soup or tomato sauce over the winter. The roasted peppers alone would have been enough work for a Saturday afternoon, but those tomatoes weren’t going to stay at their prime while I was out on the veranda reading a book. So, some serious sauce-making activity was called for. I made two big batches Saturday afternoon and another one on Sunday. Just to give an idea of the work that went into this, we chopped a total of 9 onions, 12 cherry bomb peppers, 18 cloves of garlic and 90 (count em!) Roma tomatoes. All of it a fragrant labour of love. The outcome of this was about 42 cups of thick, intensely flavoured, brilliantly coloured tomato sauce, all of it now tucked into our freezer in several portion sizes to meet a variety of needs over the coming months. 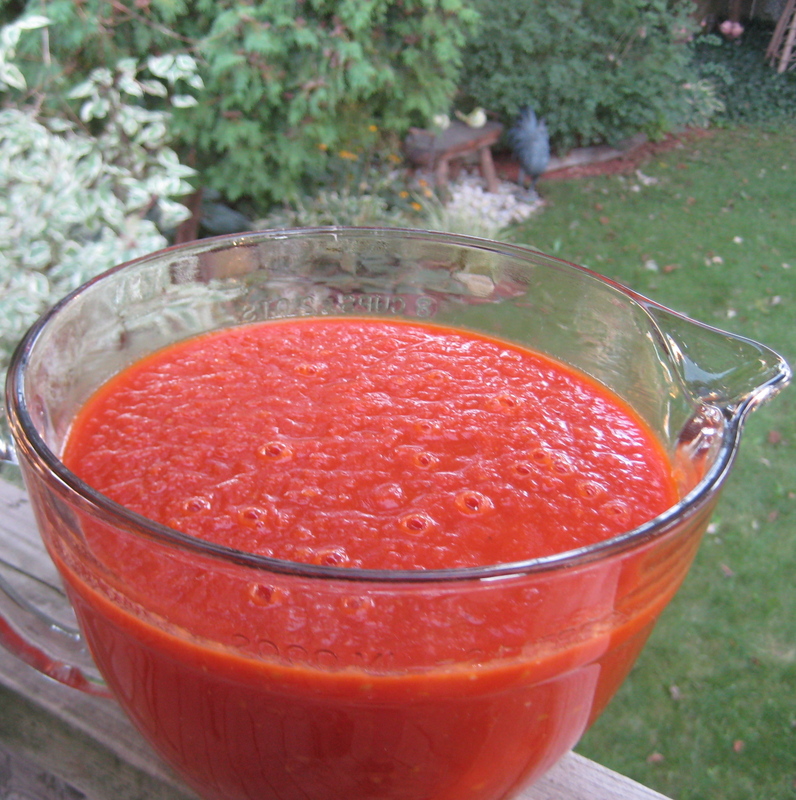 Now, when I say tomato sauce I’m really referring to the base for a tomato sauce. I made mine with only onion, garlic, peppers and Roma tomatoes. Oh, and a good grinding of black pepper. That’s it. In the past, I’ve thrown in herbs and other types of peppers if I have them, but I decided to keep it simple this time. When I use the sauce in the winter I can add my choice of herbs and seasonings, and maybe some red wine or some of those roasted red peppers, depending on the dish I’m making. And that wasn’t all, people! I still had over 20 Roma tomatoes that I simply trimmed, cut in half, froze on cookie sheets and then sealed in an extra-large freezer bag. These will give me the pleasure of making tomato sauce from scratch sometime while the snow is flying outside my window. Don’t think I forgot about those beefsteak tomatoes. I cut each into 8 pieces and froze and stored them in the same manner as the Roma tomatoes. They’ll be great for dishes like stews and soups over the winter. Believe me, 15 of those big beauties go a long way! I still have a few tomatoes on the counter for our use over the coming week. Even after all that work with tomatoes, I still have an appetite for them! By the way, it’s my daughter Jenn’s birthday today, so I also made a cake Sunday afternoon and the frosting for it in the evening, ready for assembly before the celebration tonight. I think that by any objective measure, that was enough work in the kitchen for one weekend! As I mentioned above, my sauce base is a little different each time I make it. Here’s how I made each of the three batches we produced and froze this weekend. The cherry bomb peppers have a very mild heat to them. If you like a hotter sauce, add whatever hot peppers you like. Or, for a milder sauce, use one red bell or red shepherd pepper in place of the four cherry bombs. Each batch makes about 14 cups. When I use this in the winter, I’ll add herbs, seasonings, red wine, etc. as the recipe and my fancy call for. Chop 3 cooking onions, 4 cherry bomb peppers and 6 cloves of garlic. Put a couple of tablespoons of olive oil in a large pot (Dutch oven or larger stock pot) over low heat. Add the chopped vegetables and a good grinding of black pepper. 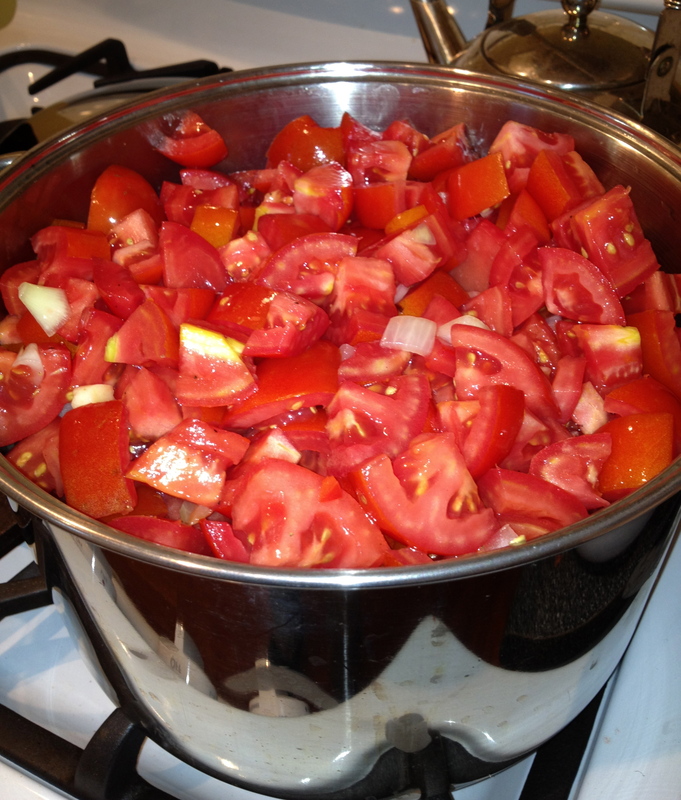 Stir occasionally while preparing the tomatoes. The onion mixture should get translucent but not browned. Trim and chop 30 Roma tomatoes. Add to the pot, stir well and turn up the heat. Once bubbling, lower heat to a simmer and cook for at least 30 minutes, preferably about an hour, stirring occasionally. Puree with an immersion blender and cook for a while longer. Cool, then divide into containers and freeze. Your kitchen sounds just like mine. I do my basic sauce like yours as well. When defrosted, you can turn it into any tomato based recipe with the addition of different herbs and spices. 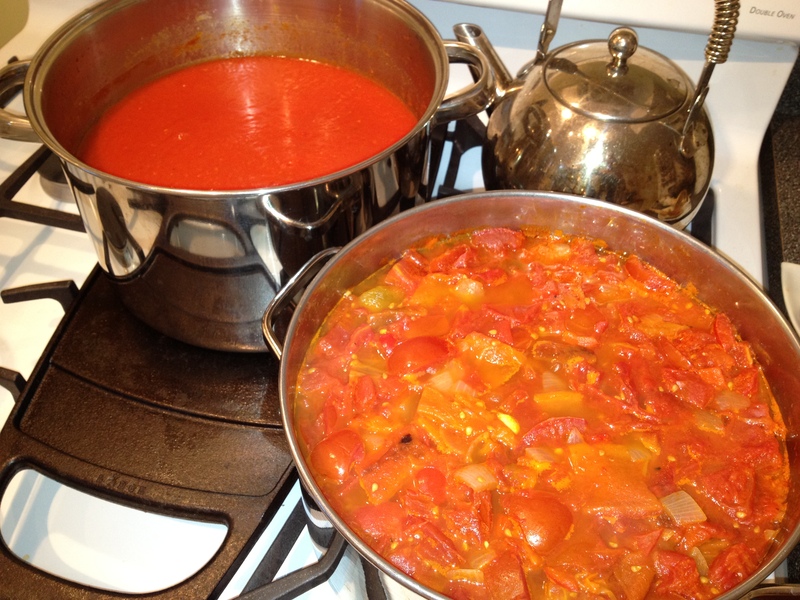 The sauce is really quite versatile, and so much nicer than using something commercially bottled or canned. Mine may not last the whole winter, but it’ll get me through most of it! Thank you! They looked so vibrant sitting on the table like that. I have to say your pictures of the tomatoes and peppers are very artistic! And you made the hours of work sound like so much fun 🙂 But now you’re done and you can enjoy the birthday cake and just relax! Artistic! Wow, that’s a great compliment! All those shades of red just looked so vibrant, it was almost a shame to chop the vegetables up. Joy, thank you for your good work, and for bringing your beautiful produce into the city. Also, for telling me about the MyPick program. I wasn’t aware of it before, and anyone interested can find more information at http://www.farmersmarketsontario.com/mypick/. “MyPick” certified farmers sell what they grow, as opposed to being resellers. When you buy produce from a local MyPick farmer you know you’re buying (and eating!) locally produced food. I grew up on a farm, and know it is so, so important to support our farmers! Real food doesn’t come from a factory! What a weekend you had! I, too, prepare and freeze tomatoes, filling a freezer in the process. Over the Winter, I just grab a quart or 2 instead of buying a can of tomatoes. I, too, bought cherry peppers but I pickled mine. I’ve never thought to include them in a tomato sauce but it sure does sound like a good idea. And a belated happy birthday to your Jenn. Many more! Thank you for the birthday wishes for Jenn; wait until you see her birthday cake – 3 layers of decadence coming soon! Marlene, this has inspired me to make sure I add to calendar now a day in September to do up tomatoes and peppers. And you are so right, they delight you all winter long. Booking a day in the calendar now to process a large quantity of peppers and tomatoes in September is a great idea!